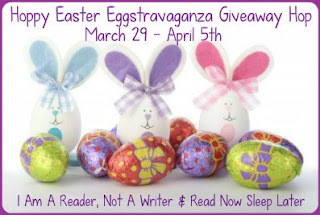 I am giving away 4 prizes: 1 paperback (US mailing only) and 3 ebooks. Your choice of books from among my young adult and middle grade novels as seen in the side bar. There are two Rafflecopters below - 1 for a paperback and 1 for the ebooks. You may enter both. No tasks at all. Happy Easter - Jesus died for YOU! I stumbled across your page and I have to say not only do your books sound good but I love the cover art. I read alot and a lot of times good cover art will draw my eye.And yours are definitely eye catching. On a sidenote rafflecopter says to leave name and address but theres no where to put it. Happy Easter to you and yours also. my name is Christiane C.
Not an entry, just wanted to comment. I LOVE that you added Jesus died for YOU! Happy Easter dear sister! He is RISEN! I'd love to win a digital copy of The Secret in the Hidden Cave. The series sounds like something my daughter would enjoy, thanks. Happy Easter or should I say, Hoppy Easter! I love these hops so much! I try to do every one I come across. For this Easter, I celebrated by sleeping in and then going out for dinner and ice cream with my family. It was fun. I hope that your Easter was just as fun! I would like an autobiography. I would be interested in teh guardian's diary for paperback or digital.